Telosys Tools ver 2.1.1 - What's new ? 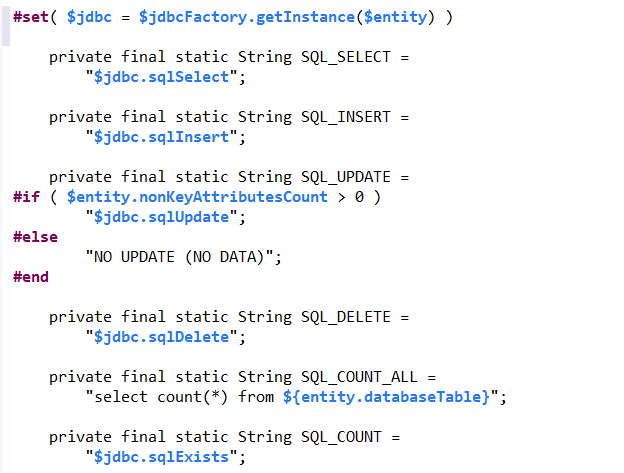 The generator provides new objects usable in the templates in order to generate native JDBC requests. With these new objects it's now very easy to generate DAO based on JDBC. Another object has been added, the $h2 object. This utility object can be used to generate the DDL for a "create table" statement in a "H2 database"
It has been design to facilitate the generation of JUnit tests using a H2 database "in memory". The columns comments stored in the database are now available in the model. The comments are now retrieved from the database and exposed in the model. They can be used in the templates. When generating the repository model it's now possible to use "regular expressions" to filter the table names. One "regular expression" to "include" and another one to "exclude" table names. The "regular expressions" are based on the standard Java RegEx provided by the JDK.